DMS Flooring SuppliesInsights to DMS5 Great flooring tips to make your HMO look, feel and sound better than the competition! I’ve been a property investor for 15 years now and I adopted this same bad attitude up until around two years ago. Even though I own a wholesale flooring business with access to the lowest prices I still scrimped on the cost of flooring! Yep I was being a tightwad! 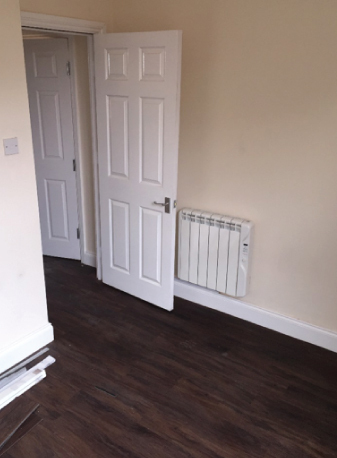 Recently I made some new friends at my local property investor club and was lucky enough to visit one of their new HMO’s to help them with their flooring requirements. While I was on site, I was shown a completed HMO next door so I could get a feel for what they wanted. I was presented with the most impressive communal areas I’ve ever seen that were on par with a beautiful home. From the huge Kitchen with granite work tops, floor to ceiling ceramic tile bathrooms with walk in showers, sensor lighting so no need for light switches, stunning decor and last but not least the flooring! This set of events inspired me to turn on a laser focused attitude! I immediately started renovating my own properties one by one. And as I own a flooring business I couldn’t wait to go wild with making a big impact. I’m now enjoying my portfolio grow in value, be irresistible to tenants, rental profits are increasing dramatically and most importantly the properties are attracting blue-chip tenants who look after the properties. Not only that, they pay their premium rents on time, month after month. It’s a win/win situation. The greatest part of all this too, is that the money it costs to renovate the property can be financed with ease by the extra rent the property generates, with cash left over. Add that to the capital growth and you can’t afford not to get busy with renovation work! All this enables you to relax and have a great night’s sleep knowing you’re property portfolio is the best it can be! So as flooring is my bag, I wanted to share the 5 most important tips to make your next renovation project a huge success. 1 Work from the ground up – subfloor preparation is the key! Like everything in life, a good foundation will enable you to work miracles. Follow the below tips and do not deviate from this advice. Under the Carpet ask your floor layer to make sure all the floorboards are screwed tight to eliminate creaks and squeaks. Fill all holes where there are dangers of high heels potentially slipping through and puncturing the carpet. Going onto concrete? Is it rough? Get the fitter to level the floor with a suitable levelling compound. If it’s fairly smooth, a good underlay will cover any minor imperfections. Under Laminate or Wood It’s really important the subfloor is level, if you’re floating a laminate or engineered floor across a bumpy floor you’re going to end up with a bouncy floor! Not good. Once it’s level, make sure you use a decent underlay with a moisture barrier to inhibit any potential damp that could get into your flooring. Oh and fit the floor before you install the skirting. This means you can hide an expansion gap with your skirting board and not the nasty looking beading trim. It will be a really crisp finish. Got a chipboard floor or floorboards? You must ply line the floor with a decent quality 6mm thick plywood. Chipboard can shrink, no matter how smooth or good a quality it is. You need to make the floor stable and ply does this perfectly. Once you’ve stapled your ply down securely, mix up some feather finish and scratch coat the floor with a trowel. This will fill in all the minor holes where the staple heads have fired through the ply. Also you’ll fill all the hairline joins in between the sheets of ply. Got a concrete floor? Depending on what levelling compound you use you may need to prime the floor with a Neoprene Primer. Read the product instructions carefully and follow them. Do not cut corners! Some levelers dry so hard, their tensile strength has a grabbing effect on the subfloor. If they are not bonded properly with a primer the leveling compound can dome up and pop off the floor. One day you’ll walk over the floor and notice a lump and then you’ll hear a crunching sound where the compound has broken up under your beautiful new flooring. Sub floor prep is key! 2 Entrance matting – clean yourself up! Entrance Matting is cheap, you can buy it through your flooring contractor, online, wherever. Coconut matting used to be all the rage. Problem is, it’s too thick and sometimes doors need to be trimmed, it also sheds coconut hair all over the place and they get walked through into the rest of your house. Ask for a dark brown or anthracite ribbed matting. This stuff comes in a 2m width on a roll, so make sure you order enough length to go from one side of your hall to the other. As you pay for that 2m width you might as well get the floor layer to fit it as far into your hallway as possible. It’ll grab more dirt and also cover more floor so less of the other flooring is needed! See image below. Ok so this is where the fun begins, your HMO will be judged by these communal areas so they must look nothing less than beautiful. Take my advice, prep the floors according to my tips above, fit some wood effect Luxury Vinyl Tiles like Brampton Chase flooring which youy can buy directly from DMS Flooring Supplies, go one step further and frame all the areas with a border (See images attached of a block of flats I recently renovated). 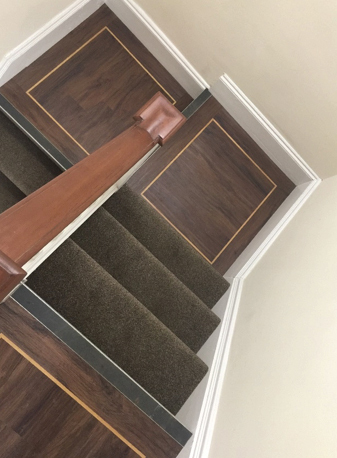 Fit a decent quality dark brown carpet on a good quality underlay on the stairs to minimize noise and I guarantee it will set such a high standard and inspire your tenants to look after the building, they’ll be proud to live in such a cool place. Spending more on this area will pay huge rewards. The Kitchens and Bathrooms in your HMO will take a hammering, so if you put down a cheap floor it will look dreadful within a year. Ceramics are ok as they last a long time, but they often crack when people drop things on them, then all of a sudden you’ve got a problem. Again, make use of a luxury vinyl tile like Brampton Chase. This product is almost bullet proof. You can fit it over underfloor heating, high temperature areas, drop anything on it and it will not harm it, spill stuff on it, bleach, coke, anything and it will stand up to it. All you need to do is mop it back with a mild floor cleaner or floor wipe and it’ll look good as new. Laminate flooring and Wood in these areas are not worth the risk. Laminate is made from a high density fibre board (HDF) core. If water sits on it, it will get into the cracks and once tha t happens your boards will swell up and the edges will lift. Game over. Wood flooring works ok but again, wood and water are not best friends. Depending on the planned quality of your HMO, which will be good I hope after reading this blog. You have a few choices with the bedrooms. Carpets are the obvious choice. If your subfloor is smooth, don’t be afraid to put down a felt backed carpet. 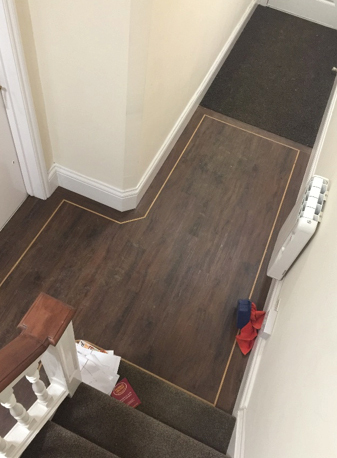 They are cheap, quick to fit and no underlay or gripper is needed. They’re quick to change too when a tenant vacates. If you want to keep the communal area vibes rolling into the bedrooms, go for a laminate, a wood or again a Luxury Vinyl Tile. When tenants move in an out, the floor will look new for years! The thing to remember here is that flooring might cost you double, but it will last 5 times longer and bring in so many more benefits like I said above. More capital growth, more rent, more quality tenants, more rental security and most importantly more sleep knowing you’ve built yourself a beautiful portfolio of top end properties that are a cut above the rest. Enjoy your next project! Author:- David Gowling, Managing Director – DMS Flooring Supplies & GoFloorIt. Call us for a chat anytime!